Refugees flee because it is unsafe to live at home. It may be unsafe because they are being persecuted or they fear persecution as a result of who they are or what they believe. Refugees may have had their human rights violated or threatened because of their political opinion, their membership of a particular social group, their nationality, their race or their religion. War may have broken out in their country. Flight from persecution often involves difficult and dangerous ordeals along the way. Many refugees are forced to flee at night in the midst of conflict and confusion. There may be no time to collect travel documents. For others it is too dangerous to travel on genuine passports or identity papers. The countries that refugees flee from are referred to as source countries. War or conflict is usually prominent in these countries. During World War II in the 1940s many refugees came from European countries. In the 1970s many refugees came to Australia from Vietnam and Cambodia due to the American Vietnam war and Indochina conflicts. During the last decade many people have come to Australia from Iraq and Afghanistan because of the wars. Refugee people come from a variety of religious, ethnic, cultural and linguistic backgrounds. The UNHCR provides information that shows refugee source countries and destination countries. 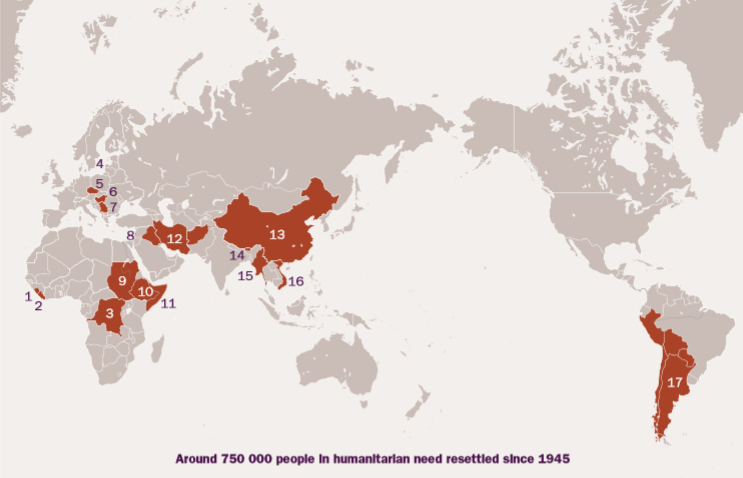 This can be found at UNHCR » Statistics and is illustrated in maps at UNHCR’s map portal. What is it like to have to flee your home suddenly?